The Cathedral of S.Echmiatsin was built in the 4th century and rebuilt in 480's. 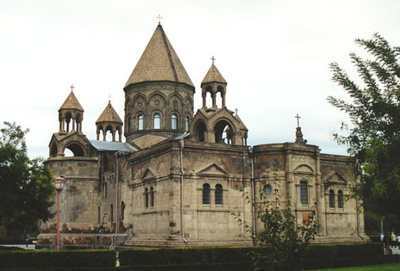 It is the seat of the Katholikos of the Armenian Church and is located in Vagharshapat, Republic of Armenia about 25 km from Erevan . The Cathedral is part of a monastery having the same name and is surrounded by walls which enclose a series of structures. These structures include the Palace of the Katholikos, a seminary, museum, refectory, synod house, library, printing house, monks' cells, and other auxilliary buildings.